1 lb. of delicious "Hot Beef Jerky"
Hot Beef Jerky – well after 40 something years of making our Famous “Original” Beef Jerky, we were asked if we had anything a little hotter. So Sam Whittington went to the kitchens and came up with this savory but spicy Beef Jerky recipe. He basically took our “Original” and added flaked and crushed red cayenne pepper. It takes a minute to catch up to you, but then hold on to your socks! Again, we only make it one way, Quality! We buy USA BEEF only, hand cut and mix the jerky with its simple list of ingredients and slow smoke in our one of a kind smokehouses for a long time. 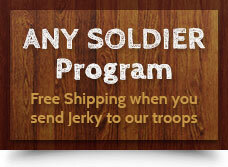 When you open the vacuum pouch you’re getting the aroma of the finest made jerky, ANYWHERE!